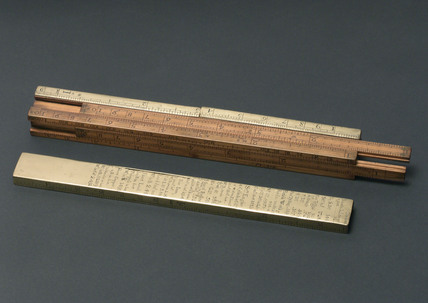 Square ullage slide rule, with additional engineering data on sliding brass scales, made by Edward Roberts of Dove Court, Old Jewry, London. Ullage is the term used to describe the loss of alcohol in a barrel through leakage or evaporation. Excise rules were used from the late 17th century to calculate the quantity of liquor in a barrel when full, and a ullage rule can be used with a gauging rod to find the volume when the barrel is partly empty. The calculations were very complicated. Alnico telephone receiver magnet, 1938. Control mechanism of Bleriot's monoplane, 1909. Model of the transit of Venus, 1748-1761. Mechanical digital wristwatch, c 1932. 'No battery' quartz analogue wristwatch, 1984. 'Tri-Compax' calendar chronograph wristwatch, c 1955-1960.